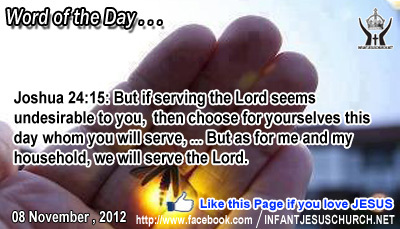 Joshua 24:15: But if serving the Lord seems undesirable to you, then choose for yourselves this day whom you will serve, ... But as for me and my household, we will serve the Lord. Heavenly Father, on how to lead our family to love you more. Please bless our parents and thank you for their faith. Please give us courage and compassion so that we can efficiently share your truth with our children. O God, please bless those parents who are seeking to raise godly children. We want our house to be a place where you are known, respected, honored, and loved. In Infant Jesus' name we humbly ask this. Amen. 1 Now the tax collectors and sinners were all drawing near to hear him.2 And the Pharisees and the scribes murmured, saying, "This man receives sinners and eats with them." 3 So he told them this parable: 4 "What man of you, having a hundred sheep, if he has lost one of them, does not leave the ninety-nine in the wilderness, and go after the one which is lost, until he finds it? 5 And when he has found it, he lays it on his shoulders, rejoicing. 6 And when he comes home, he calls together his friends and his neighbors, saying to them, `Rejoice with me, for I have found my sheep which was lost.' 7 Just so, I tell you, there will be more joy in heaven over one sinner who repents than over ninety-nine righteous persons who need no repentance. 8 "Or what woman, having ten silver coins, if she loses one coin, does not light a lamp and sweep the house and seek diligently until she finds it? 9 And when she has found it, she calls together her friends and neighbors, saying, `Rejoice with me, for I have found the coin which I had lost.' 10 Just so, I tell you, there is joy before the angels of God over one sinner who repents." Search until what they have lost is found. Their perseverance pays off. They both impulsively share their joy with the whole society. The poor are mainly good at sharing in one another's grieves and joys. What was new in Jesus' teaching was the persistence that sinners must be sought out and not just mourned for. God does not celebrate in the loss of anyone, but desires that all be saved and bring back to association with him. That is why the whole community of heaven rejoices when one sinner is observed and restored to fellowship with God. Seekers of the missing are much needed today. Do we tirelessly pray and seek after those you know who have lost their way to God? Loving Infant Jesus let your light dismiss the darkness that what is lost may be found and restored. Let your light shine through us that others may see your truth and love and discover hope and peace in you. May we never doubt your love nor take for granted the compassion you have shown to us. Fill us with your renovating love that we may be merciful as you are merciful.